It is hard to fully understand the saying “everything’s bigger in Texas” until you actually start driving through the state. It takes more than 10 hours to drive from Houston to El Paso. It is home to 4 of the 12 most populated cities in the US. And if you have ever visited a Buc-ee’s Gas Station (home of the world’s largest convenience store and 120 fueling stations) you know exactly what I’m talking about! Being such a big state, meant that even in about 4 weeks of visiting we still didn’t even come close to seeing everything that Texas has to offer! We started our visit to the Lone Star State by going to the Houston Livestock Show & Rodeo. Going right along with the big theme, the Houston Rodeo is the largest livestock exhibition and rodeo in the world. The event goes on for about 2 weeks and draws more than 2.5 million attendees! Outside the football stadium is a huge carnival… well carnival might be too much of an understatement. It is more like an entire theme park filled with food and rides that is constructed and torn down every year for this one event! The food of course is awesome and the options are endless. Every night, there is a huge concert with some of country music’s biggest names. Since Em is a big country fan, we couldn’t pass up on the opportunity to watch Thomas Rhett, Luke Bryan, and Florida Georgia Line. They were all incredible in concert, and sounded just like they do on the radio! I had never seen a live rodeo before, so it was a pretty cool experience with thousands of fans cheering the cowboys on! Our favorite event though had to be the Mutton Bustin event. This is where little kids held onto the backs of sheep for as long as they could to see which kid could ride their sheep the furthest! They were some pretty tough kids and it was a lot of fun cheering them on as they rode their sheep! The Houston Livestock Show & Rodeo is definitely a unique and must do experience if you ever find yourself in Texas in March. During our visit at the Houston Rodeo, we stayed right across the street at the Hotel Ylem. If you’re ever at an event at the NRG Stadium (also where the Superbowl was held! ), I highly recommend staying here. We didn’t have to pay for parking or try to fight the hundreds of thousands of other people going to the rodeo; we could walk there! They also offer a shuttle to anywhere within 3 miles of the hotel, which is awesome and so rare for a hotel to do that! I think the reason why they offer things like that is because the owners of Hotel Ylem truly desire to make people happy. They are a family-owned hotel that want to not only bless their guests, but also make a difference in the world. They donate to charity: water and recently finished super cute, artsy hotel renovations where just about everything in the rooms has been purchased from businesses who also give to charities. From the paper products to the bedding, it all has a story. Hotel Ylem intentionally chose items that would be a blessing to other people, even though it wasn’t necessarily the most cost-effective for their business. When we asked one of the owners why, she said they just really want to be faithful with what they have and to encourage others to make a difference. It sure has motivated us to do so, and to think more about the type of people we want to be. Didn’t know a hotel could do that, but it has. So thank you, Hotel Ylem! Also, they have continental breakfast and the cutest hotel rooms, so win-win-win. We had an amazing stay! On our way from Houston to San Antonio, we stopped in at Six Flags Fiesta. They had a lot of great roller coasters and rides. And it is always a plus for it to be the beginning of March and be able to not be freezing our hands off at an amusement park! Although we might have to go back sometime to try out their new Thunder Rapids, the world’s largest rocket blast water coaster. Sounds like a lot of fun! Not too far away from Six Flags is SeaWorld San Antonio. This is the second out of three SeaWorlds that we have visited on this trip. Like SeaWorld in Orlando, they had some cool animal exhibits and amusement rides. But the thing that made our visit here extra awesome was that we got to swim with beluga whales! I mean how many chances do you get to swim with whales?! Our trainer was really awesome and kind, and you could tell how much he really cared and enjoyed working with the whales. He has been working at SeaWorld for decades and was actually the one to help start the beluga whale interaction program, which was incredible! During the experience we got to interact with several different beluga whales. It is amazing just how intelligent and talented these animals are! It was cool to see each whale’s different personality and to interact with each one. I would definitely recommend checking this experience out if you are ever in San Antonio. It is truly a once in a lifetime experience! No matter what time of day we were there, it seemed like there was always so much to do and see in the city. Of course, no trip to the city would be complete without a trip to The Alamo. And if you have the time, the Mission San José is also well worth a visit. About 45 minutes outside of Austin is Hamilton Pool, which looks like it was taken out of a scene from a storybook. It was just a short hike from the parking area and we got there early enough that the pool was still relatively empty. The only bummer about the visit was that we broke our camera there when our tripod fell over. (I guess you could say that this place was so pretty that our camera broke =) But broken camera and all, this pool was definitely worth the visit! The city of Austin is a really cool, young, and really quickly growing city. Someone told us that Austin is one of the fastest growing cities in America, and it is pretty easy to see why. From art, to food, to music, to outdoor adventures it seems like Austin has a little bit of everything. One unique place that we went to is called Hope Outdoor Gallery; it’s a spray paint park where anyone can spray paint anything on the walls. We of course sprayed an RV! A really cool and unique experience was taking a cruise down the Colorado River with Capital Cruises to watch bats fly out from under one of the busiest bridges in the city. This is the largest urban population of bats in the world. Almost every night from March – November, thousands of people come out to see more than 1 million bats come streaming out from the bridge. A really nice thing about taking the boat tour was how knowledgeable our guide was about the bats and city in general. Our tour guide explained to us that these bats travel from Mexico in order to have their babies in Austin. The small slants underneath the bridge provide a perfect home for the bats during their stay in the city. It was really cool to be sitting in the river and watch all the bats flying out for the night – we couldn’t believe how many there were! Our next stop was Waco, and we started by visiting Baylor University. We’ve enjoyed visiting different colleges along the way and seeing how each one is laid out. Baylor has a really pretty campus and their football stadium alone is worth a visit! But the highlight of our visit definitely had to be when I randomly got to ride in the passenger seat of a corvette through a speed course! I wrote about that experience in this post. It was definitely a great reminder to always listen to your wife and go out of your way to meet new people! 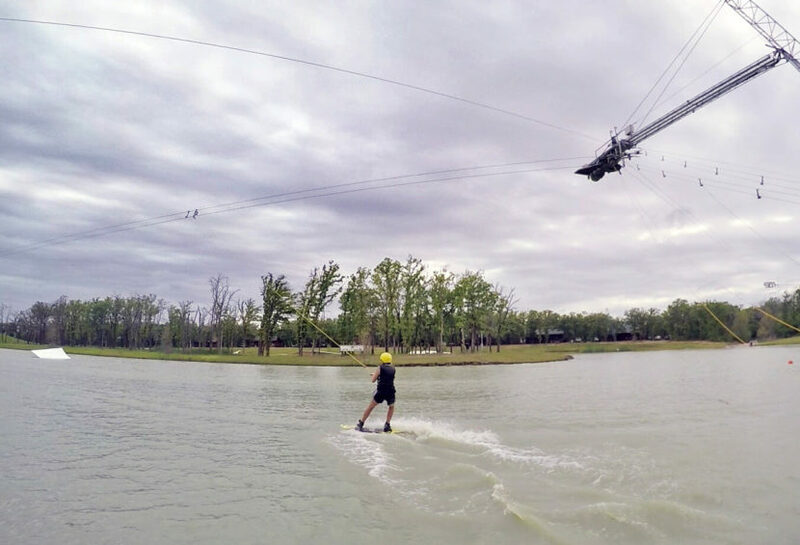 Going along with the “everything’s bigger in Texas” theme is the BSR Cable Park in Waco. For any adventure seekers out there (or even just people who would enjoy hanging out in the world’s largest lazy river) this waterpark is definitely a must-do experience! The best way to explain the BSR Cable Park is as a waterpark for adults. In fact, if I were to build my dream water park in Rollercoaster Tycoon, it would look like the BSR Cable Park. The park itself is home to the world’s largest lazy river (nearly 1 mile long! ), a giant wakeboarding/waterskiing cable park, cabins, tons of grilling and picnic areas, and a really nice restaurant that overlooks the park. But probably the most popular attraction at the park is the Royal Flush, a 100 foot long water slide that sends you soaring through the air into a 15 foot deep pool. If you search “Giant Water Slide” on YouTube, it will probably be one of the first results that pops up. The view standing at the top of the slide is admittedly a little intimidating, but the rush of being flung through the air is well worth it! Em and I spent most of our day just hanging out, riding the slide, and watching other people ride! They had music and an emcee that would comment on people riding the slide, which made it almost as entertaining to watch as it was to ride! (Plus the giant pool at the bottom of the slide is heated, so I felt like I really could sit in it all day.) It is difficult to explain just how fun, addicting, and terrifying this slide is without being able to experience it for yourself. They even let us swim across the cable park to feed some lemurs that were on the island – never knew I would get to feed lemurs again! So a message to any guy, if your wife wants to make a trip to Waco to visit Magnolia Market, make sure that BSR Cable Park is also on the to-do list! A quintessential stop of any Texas road trip is the Fort Worth Stockyards. This is a historic town where a large livestock market used to be. Today, volunteers reenact driving the longhorn cattle through the downtown like they did in days past. It is a neat experience and definitely a great photo opportunity. While we were there, the Australian Today Show was actually filming for a segment of top places to visit in the US! While there, Em and I also had some great classic Texan food – barbecue – at the Stockyards. Although I am a Philadelphia Eagles fan, I must admit that I actually really enjoyed visiting Dallas. Em and I got the Dallas CityPass, which allowed us to experience a bunch of different things in the city for one admission price. Our first stop was to the Sixth Floor Museum, which is the exact location where President JFK was shot. The museum honors the President’s legacy and does a great job of explaining his life and death and all of the details surrounding his last few hours of life. Next, Em and I headed to the Reunion Tower GeO-Deck. (Of course we couldn’t go to a city without going up something really tall! =) This 470 foot tower has some of the best views of the Dallas skyline. After the museum and tower, Em and I headed over to the SMU campus to the George Bush Library. Here, they had an exact replica of the Oval Office, and since we are not planning on running for President, I figured that this would probably be the closest I ever get to sitting behind the Resolute Desk (even if it was just a copy). But the coolest exhibit definitely was the Portraits of Courage, a collection of George W. Bush’s paintings honoring our country’s veterans. It was really cool to get to see these paintings and hear about some of the stories of our nation’s heroes. Our last stop in Dallas was definitely one of the craziest, scariest, most fun experiences of our trip! Zero Gravity Thrill Amusement Park is yet again just one more example of how everything truly is bigger in Texas. Em and I have been able to experience a lot of crazy thrills (like walking outside on the top of the CN Tower in Toronto, parasailing in Haiti, and jumping off the Stratosphere in Vegas) but the five rides at Zero Gravity were definitely some of the biggest thrills we have ever experienced. Check out this video we made to see what I am talking about. Of the five rides, Em said the scariest one for her was the bungee jump (it isn’t every day that you get the chance to jump from the height of a 7-story building). However, for me it was definitely the “Nothin’ but Net” ride. This ride is a 16-story freefall with no ropes, parachute, or any other kind of harness – you fall 120 feet and land in a net! The ride operator told us that there are only 3 types of rides like this in the world. It is definitely a weird feeling being dangled over a giant net and then suddenly free falling 120 feet with nothing but the net to slow you down! I am pretty sure it was the longest 2.5 seconds of my life, but I would definitely be up for doing this ride again. It was an incredible experience. Check out Em’s face afterward! Alphabet Date H – Horse Race – The Preakness Stakes!